Wholesaler and Distributor since 1984. Canada Souvenirs: Plush, Bags, Caps, Toques, Key-chains. Magnets, Travel Accessories, Apparel and many more souvenir items. Authorized Distributor of Zippo Lighters. Specialize in custom and corporate orders. We deal in Christmas, Clocks and Watches, Dolls. 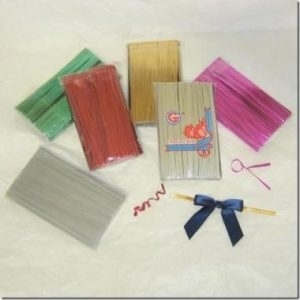 Metallic twist ties are used as closures for fancier items such as candies and specialty baked goods. Excellent for local distributors to the food and confection industry and large users with specific needs. Please contact us for a quote! Our own wrap line, plus the lifelike plush linefrom Douglas Cuddle Toys, as well as Play N Learn, Harley-Davidson and other eclectic collectible product from Xonex. We deal in Ceramics and Pottery, Childrens Products, Christmas, Handcrafted - Imported, Toys Hobbies and Games. We service retail stores of varying sizes including chain department stores across Canada. We offer products including stuffed animals, plush dolls, rocking animals, educational puzzles, and many other subcategories. We deal in Canadian Handcrafted, Country Decor, Dolls, Novelty and Costume, Plush. We deal in Canadian Handcrafted, Childrens Products, Plush, Souvenir, Toys Hobbies and Games. Come look at our new 13 inch Canada Girl Dolls Kinna and Whitney, Squishy jelly Bears, Teddy Bear Fun Viewer, die cast Moose on Patrol Cars and Moose Mobiles...Too much to mention so drop by and see our wonderful Canadian Souvenirs or call us.